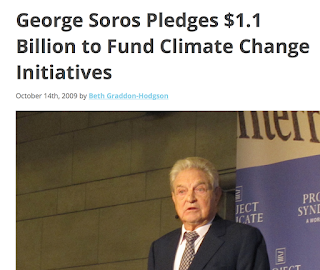 George Soros helping fan the global warming fire in 2009. While concerns about global warming may have started out as a genuine scientific and environmental concern, that era ended years ago. It is now about making money and gaining political power. We have pointed out, literally dozens and dozens of times, the hypocrisy of most of the ‘leaders’ of the global warming movement: multiple mansions, private jets, yachts, conferences in exotic, remote locations (btw, the next one is in Paris). Why bring this up? You’ve undoubtedly heard about the Obama Administration’s “War on Coal.” Already one coal company has gone bankrupt and two are in jeopardy. 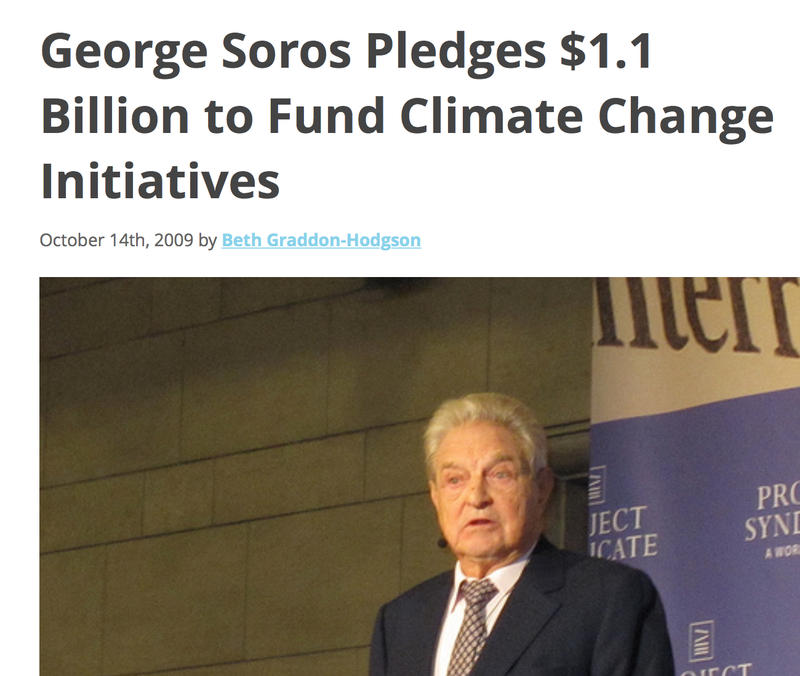 So, what is Soros, a card-carrying member of Big Climate doing? Buying coal companies!!! These guys aren't dumb. They understand the first rule of economics, “Buy low, sell high.” In a few years, after driving down the price of coal, some magic technology will be anointed “clean" coal and the value of these companies will soar. Billionaire Soros will get even richer – even higher into the .01%. Ordinary people – especially the poor – will suffer due to the soaring cost of energy. But, you say, surely the scientists are honest and stand for integrity? Remember how, ten years ago, in the wake of Katrina, we heard over and over and over that hurricanes were going to get worse because of global warming? Didn't happen. 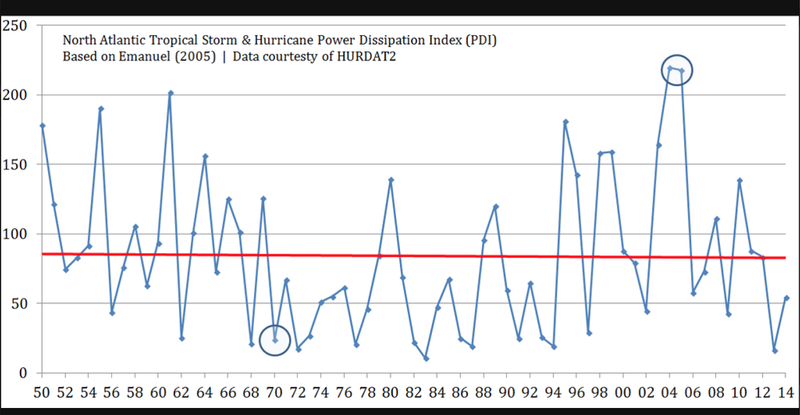 Here is a graph from topical meteorology expert, Dr. Ryan Maue, of North Atlantic hurricane intensity. Yes, things peaked in '04 and '05 and then ... the bottom fell out on hurricanes in the North Atlantic. The US hasn't had a Cat 3 or stronger hurricane for ten years -- breaking the previous record by four years! To be clear, there is nothing wrong with that failed prediction. That's how science works. 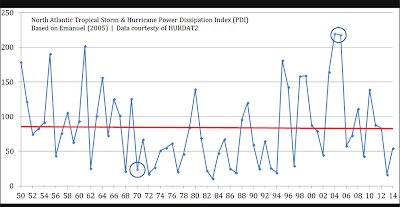 But, one researcher, (full disclosure, a friend of mine) Dr. Roger Pielke, Jr., recognized that hurricanes were not getting worse and damage from hurricanes was not increasing. 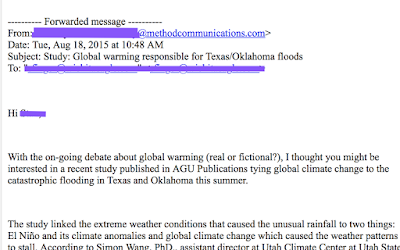 So, how did climate science react? They blocked his research, which was peer-reviewed, from making it into the report of the Intergovernmental Panel for Climate Change (IPCC). That story is here. Ten years after Katrina, it is Dr. Pielke's work that has stood the test of time not the panicked reports of ever-worsening storms. If this was truly about science and the good of humanity, the fire would have died down years ago as the scientific case for short-term catastrophic global warming has weakened. But, no, Big Climate continues to keep fanning the flame. 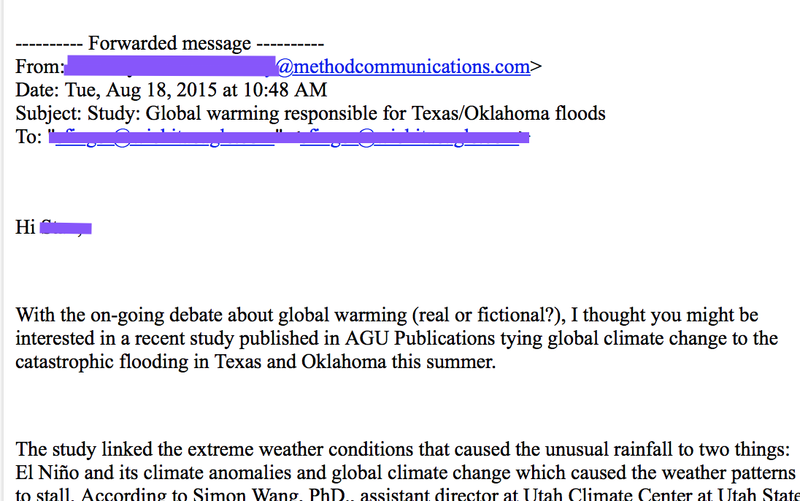 Today, a reporter friend of mine received an email (below), not from a scientist, but from a professional "influencer," Method Communications, trying to get him to write about a story how global warming caused the floods in Texas and Oklahoma back in May (what doesn't global warming cause?). Here is a portion of Method Communications' web page which will give you pretty good idea of what they do. Their goal? Not to improve science. It is to fan the flames of global warming hysteria. And, far too many reporters (who tend to skew liberal, like Mr. Soros and Mr. Gore) will fall for it. I call these people Big Climate for a reason: Companies like Method don't work cheap. By far, the big money is on the pro-catastrophic global warming side. As reported above, Mr. Soros gives billions. But, don't worry, he'll get it back with artificially cheap investments later. This mirrors what is happening in BIG PHARMA as well.... blocked science and cronysim and greed.